$5 Art Workshop. Take home your own painting! 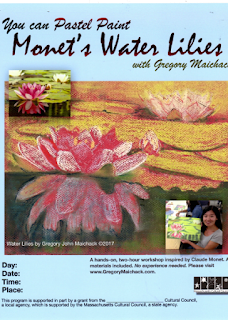 The workshop is a two-hour event that enables beginners to advanced adults to learn and paint like Monet. 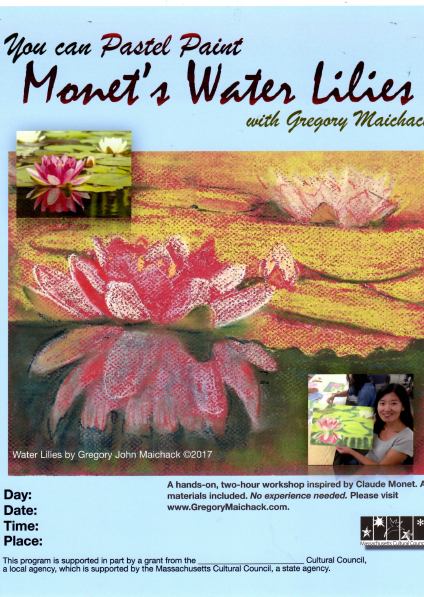 The workshops offer participants interesting and entertaining historical information about Monet’s life and painting techniques, a demo at easel, and participants’ own hands-on experience with pastels (all professional-grade materials supplied). All take home their own pastel painting. Space is limited, so pre-registration is required. Register by visiting the Upton Town Library, or calling 508-529-6272. Suitable for ages 16 and up. This program is supported in part by a grant from the Upton Cultural Council, a local agency which is supported by the Massachusetts Cultural Council, a state agency. Admission $5, Free for Students.